Question: What is your opinion on the greenhouse gas reduction targets announced by the government, of 15% lower than those in 2005? We assess the target figures announced by the government as the bare minimum for industrialized countries. This is very important even for the operation of our company. At Ricoh, we believe environmental conservation and profit-generation are realizable simultaneously and we will actively advance towards that end. Ricoh aims to cut greenhouse gas emissions down to one-eighth the 2000 level by 2050. This is quite an impressive goal that we hope to attain through technological development and management reforms. Question: For individual consumers, we know that Ricoh makes cameras, however, do you make anything else for them such as printers? We recognize that our appeal to regular consumers is still weak. Our “GELJET” and other compact printers are designed and priced even for individual consumers. In the future, we will further strengthen our product lineup targeting the low-end market. Question: Does Ricoh have a business continuity plan in the event of a disaster? We have a plan not only for the continuity of Ricoh’s business but also for that of our customers as well. The plan, now in progress, already establishes all roles. We have a business continuity plan in place because of Ricoh’s perspective as an operational infrastructure provider. Specifically, in our system, the recovery objective is to restart operations at normal service levels at disaster areas on the eighth day after the event occurred. For non-disaster areas, we aim to restart operations at normal service levels on the third day. Question: Your consolidated net income is ¥6.5 billion, while your non-consolidated net income is ¥23.0 billion. Can you explain that? 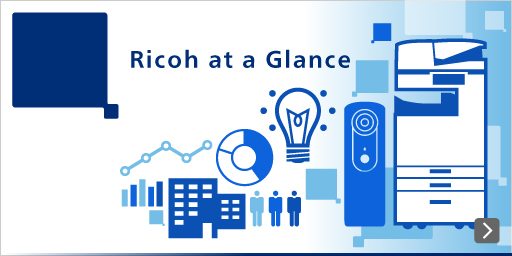 Ricoh develops its business by dividing its development, production and sales functions globally. The consolidated and non-consolidated balance varies depending on periodically changing circumstances. In the fiscal year under review, each region was affected by the global economic downturn caused by the subprime crisis and our operations particularly in the Americas were in the red.